When the three-story Eagle Hotel opened at No. 44 White Street, between Broadway and Church Streets, the block was still mostly residential; lined with brick-faced three-and-a-half story homes. But the end of the line for the hostelry came in 1859. On February 21 that year auctioneer William Witters announced he would be auctioning off "all the furniture, &c.," in the hotel, "also office and barroom furniture; also wines, liquors, segars, &c."
The development of the 25-foot-wide site was most likely thwarted by the outbreak of Civil War. As thousands of New York's laborers marched off to the South, construction ground to a near halt in the city. But in 1865, the year the war ended, Aaron and Eliza Jacobs set to work. In place of the old hotel rose a five-story loft and store building, completed in 1866. Above the cast iron storefront, with its fluted Corinthian columns, were four stories of stone, quite likely marble. The Jacobs's architect, whose name has been lost, had turned to the popular Italianate style for his rather elegant design. The arched openings of the upper floors wore molded enframements. Prominent string courses separated each floor. The center windows of the second through fourth floors were embellished with scrolled keystones and triangular pediments supported on carved brackets. A handsome blind balustrade sat below the central second floor window. The cornice was executed in stone, as well. 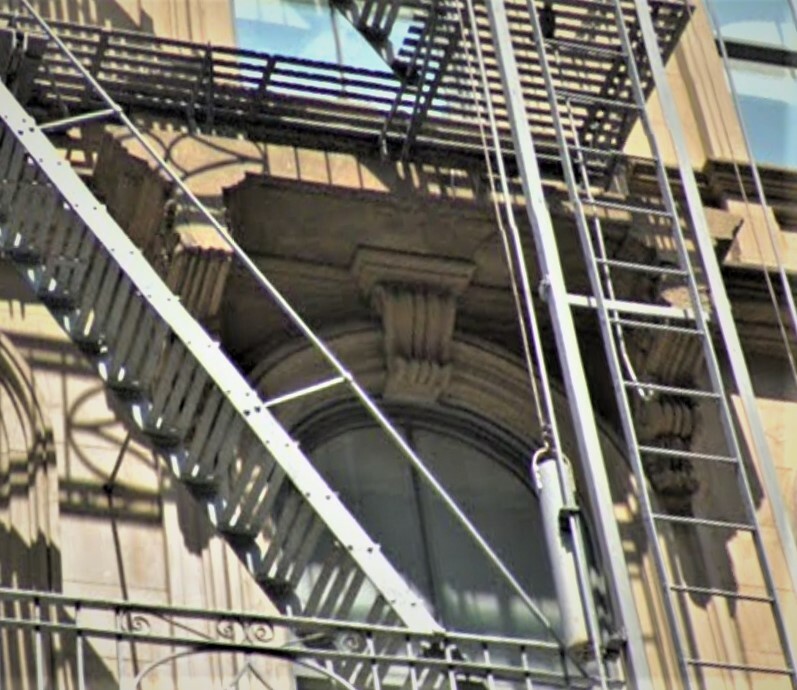 The installation of the 20th century fire escape required the disfiguring of two of the pediments. Among the first tenants were two newly-organized firms. Claude Greppo established his silk dyeing plant in Patterson, New Jersey in 1866 and by 1867 had opened his office in the White Street building. The dry goods importing form of Mills & Gibb was formed in 1865 and No. 44 was its first address. The success of C. Greppo was phenomenal and in January 1876 he partnered with another dyer to form Weidmann & Greppo. 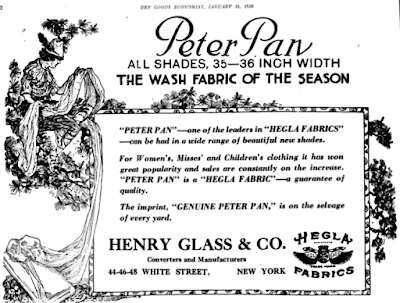 That year The Silk Industry in America wrote "Their silk-dyeing works are now the largest in the United States." Also in the building in 1867 was the manufacturing firm of S. D. Rosenbaum. For whatever reason, shortly after moving in Rosenbaum sought to sell his company. In December 1868 he ran an advertisement that read in part "For Sale--A well paying manufacturing business, working under letters patent that have sixteen years to run, together with ownership of said patent." Rosenbaum's selling price was $30,000--just over half a million in today's dollars. Before long James Hazley moved his successful linen business into the building. The son of a well-to-do merchant of Belfast, Ireland, he was college educated and considered a "fine linguist." He and his wife had two children, but following her death things began to fall apart for the young immigrant. His business fell off until he was forced to close. His increasing financial hardship necessitated his sending his children back to Ireland to live with their grandparents. The New York Herald later explained that "he met with reverses and retired from the business with very little money." Hazley found work as a salesman with the dry goods firm of Max Weil & Co., across the street at No. 47 White Street. But understandably, the loss of his wife, his business, his children and his fortune still weighed heavily on him. Around October 1878 he rented a third floor room in the boarding house of a Mrs. Bougher at No. 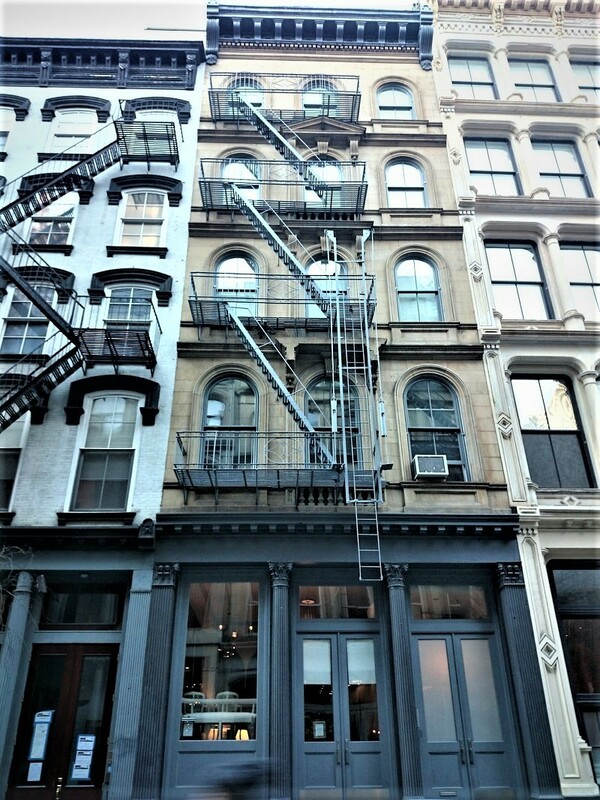 69 Macdougal Street. He went to and from work every day, but, as reported in the Herald, "had become morose, and was frequently heard to say that he was tired of life." On Tuesday evening, February 18, 1879 Hazley had dinner with the family as usual at 6:00. Afterward he went up to his room. Two days later The New York Herald reported "That was the last seen of him alive, for yesterday morning his dead body was found upon the floor. The carpet was saturated with blood. The suicide's throat was gashed from ear to ear, the jugular vein and the windpipe being severed." The article said that the "blood stained razor, by which the deed had been done," was still clutched in the 39-year old's hand. Like C. Greppo, Mills & Gibbs experienced remarkable success. It moved to Grand Street and Broadway in 1880 and in 1907 purchased land for a 16-story building on Fourth Avenue. The vast dry goods firm of Henry Glass & Co. had occupied the first and second floors of the building next door at Nos. 46-48 White Street for several when in 1913 the Dry Goods Economist reported "The white goods department of Henry Glass & Co. will remove to its new quarters at 44 White street, adjoining the firm's main establishment." The firm leased the store and basement as an annex. On February 14, 1914 the Dry Goods Economist updated its readers. 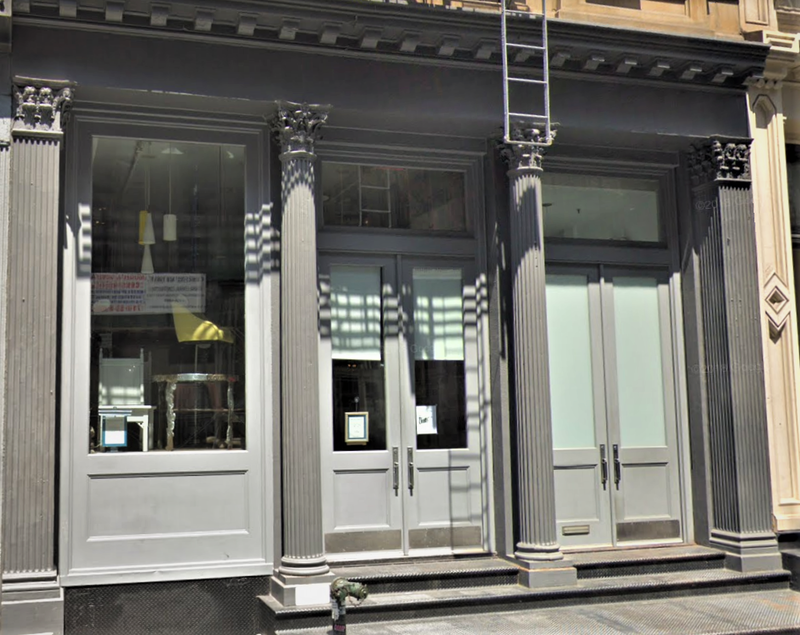 "Henry Glass & Co.'s new white goods annex at 44 White street is now open for business." The article said that the 7,000-square-feet had "been entirely remodeled as regards the interior." The firm continued to expand within the building. In October the following year it signed a lease for the top four floors, although at least one tenant, Mendes, Birnbaum & Kramer, was still in place. Then on March 17, 1917 the Real Estate Record & Guide reported that Henry Glass & Co. had leased "the building at 44 White st." The firm now joined the two buildings internally with a doorway. 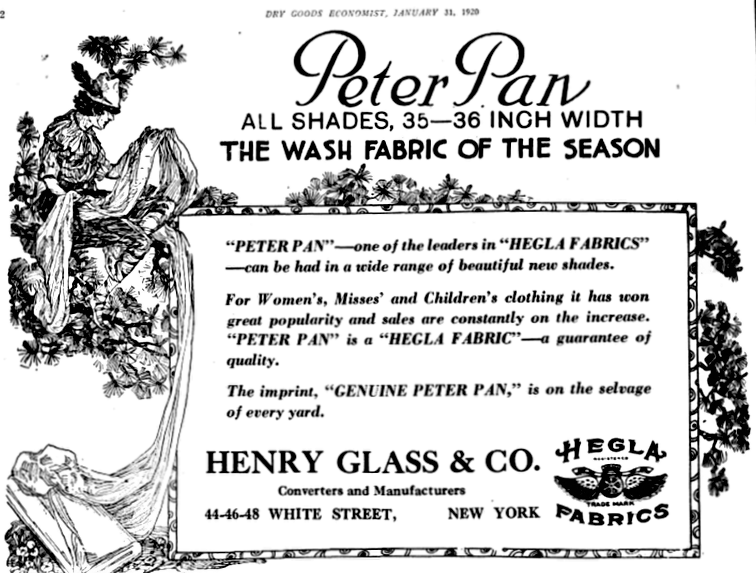 Henry Glass & Co. remained in the building at least through 1929. Afterward other textile-related firms called No. 44 home until the Tribeca renaissance arrived on the White Street block. By 1985 the Daniel Newburg Gallery was here, and in 1991 The Thing (originally all caps) was born in the basement. Conceived by Wolfgang Staehle, it was an international community of artists and art-related projects connected by a "mailbox system" using the telephone network. Staehle later described his subterranean space as "a kind of cyber cave." The Thing left No. 44 in 1995 when its internet website was launched. The cast iron storefront is wonderfully intact. The same year that Staehle rented the basement space the upper floors were converted to residential use--one spacious apartment per floor. Before 2008 the Sclaroff Gallery had opened in the ground floor. Known today as Steven Sclaroff it remains as Sclaroff's interior design headquarters.